England beat France on an emotional night as more than 70,000 fans honoured the victims of the Paris attacks. Fans united to sing La Marseillaise - the French national anthem - in front of the Duke of Cambridge and Prime Minister David Cameron at Wembley. 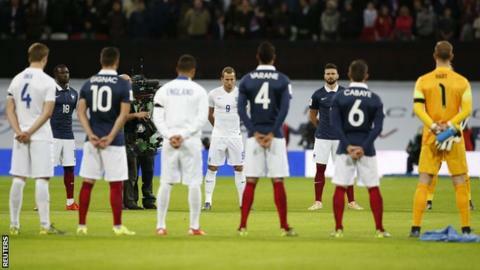 There was a perfectly observed minute's silence, with both sets of players standing together. Dele Alli scored on his full England debut, a fine 25-yard finish, before Wayne Rooney's volley sealed victory. England's 10th and final game of the calendar year brought a seventh victory yet this was a night when the result, tactics and performance were secondary. The French Football Federation chose to go ahead with the fixture despite Friday's attacks in Paris that left 129 people dead. There was an excellent show of unity for the French national anthem before England and France mixed in with each other for a pre-match team photograph to huge applause. England boss Roy Hodgson and his France counterpart Didier Deschamps embraced after joining Prince William, president of the Football Association, in laying flowers for those killed. The visitors went close to opening the scoring when Crystal Palace midfielder Yohan Cabaye, one of six Premier League-based players starting for France, fired narrowly over from 25 yards. Hodgson made seven changes to the side that started the 2-0 defeat by Spain last Friday, with the average age of England's starting line-up - 24 years 113 days - the youngest under the current England boss. Alli, 19, showed great maturity to open the scoring from outside the area, the Tottenham midfielder starting the move with a crunching tackle before firing home. Rooney doubled the lead with a close-range volley from Raheem Sterling's cross, the culmination of a move started by Alli. Forward Antoine Griezmann and midfielder Lassana Diarra both received applause all around Wembley when they came on for France. Diarra's cousin was killed in the Paris attacks while Griezmann's sister was caught up in it but escaped unharmed. England boss Roy Hodgson: "I was pleased the FA set about showing our respect and marking this sad occasion. "It was handled quite brilliantly. "It was a very poignant occasion and we achieved all the things we wanted to achieve in the remembrance. An act of defiance was better than the other alternative." France boss Didier Deschamps: "We would like to thank everyone for their statements and their actions of solidarity. We feel very grateful because not just the people at Wembley, but the whole nation has supported us." On fans uniting to sing La Marseillaise: "We felt very, very strong emotions, powerful emotions. Everyone has their own way of displaying their emotions but it was certainly a moment where everyone came together. "It was heart-rending - you felt it deep down in your gut. It was a special, moving, grandiose moment." Match ends, England 2, France 0. Second Half ends, England 2, France 0. Laurent Koscielny (France) wins a free kick in the attacking half. Foul by Adam Lallana (England). Attempt missed. Paul Pogba (France) right footed shot from outside the box is too high. Assisted by Lass Diarra. Substitution, England. Phil Jones replaces Dele Alli. Foul by Moussa Sissoko (France). Jonjo Shelvey (England) wins a free kick in the attacking half. Substitution, France. Moussa Sissoko replaces Morgan Schneiderlin. Foul by Gary Cahill (England). Olivier Giroud (France) wins a free kick on the right wing. Substitution, England. Ryan Bertrand replaces Harry Kane. Substitution, England. Jonjo Shelvey replaces Ross Barkley. Eric Dier (England) wins a free kick in the defensive half. Attempt missed. Kingsley Coman (France) right footed shot from outside the box is high and wide to the right. Assisted by Antoine Griezmann. Foul by Raphael Varane (France). Harry Kane (England) wins a free kick on the left wing. Corner, France. Conceded by Gary Cahill. Corner, England. Conceded by Laurent Koscielny. Substitution, England. Adam Lallana replaces Raheem Sterling. Raheem Sterling (England) wins a free kick on the left wing. Substitution, France. Antoine Griezmann replaces Anthony Martial. Corner, France. Conceded by John Stones. Attempt saved. Anthony Martial (France) right footed shot from the left side of the six yard box is saved in the centre of the goal. Assisted by Paul Pogba. Lucas Digne (France) wins a free kick on the left wing. Foul by Eric Dier (England). Foul by Dele Alli (England). Olivier Giroud (France) wins a free kick in the attacking half. Attempt missed. Paul Pogba (France) right footed shot from outside the box is just a bit too high. Assisted by Anthony Martial. Ross Barkley (England) wins a free kick in the defensive half.